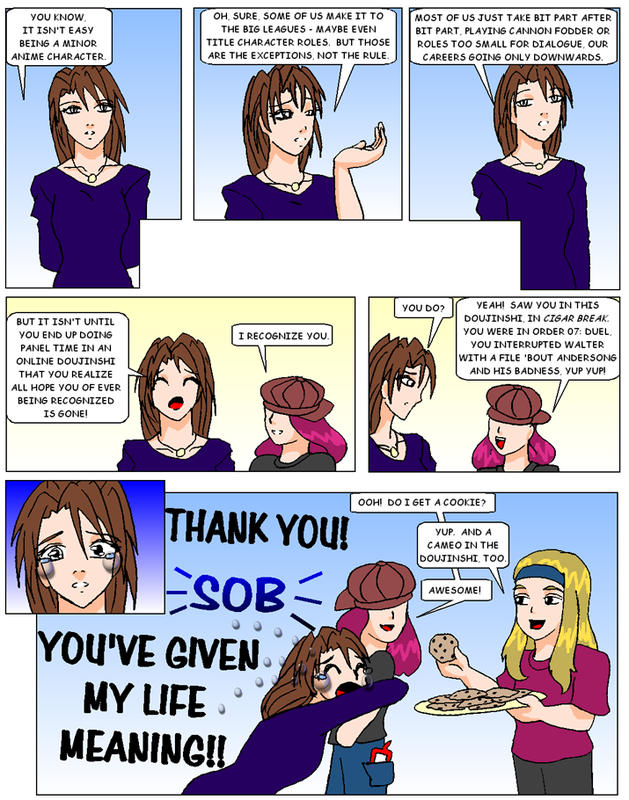 Congratulations to Oniisan (yes, a girl) for being the first and only one to recognize the character in this strip. Thien: You know, it isn’t easy being a minor anime character. Oh sure, some of us make it to the big leagues – maybe even title character roles. But those are the exceptions, not the rule. Most of us just take bit part after bit part, playing cannon fodder or roles too small for dialogue. Our careers going only downwards. But it isn’t until you end up doing panel time in an online doujinshi that you realize all hope f you ever being recognized is gone! Oniisan: Yeah! I saw you in this doujinshi. In Cigar Break. You were in Order 07: Duel. You interrupted Walter with a file ’bout Anderson and his badness, yup yup! Thien: Thank you! [SOB] You’ve given my life meaning! Oniisan: Ooh! Do I get a cookie? Erin: Yup. And a cameo in the doujinshi, too.